Free Shipping Included! 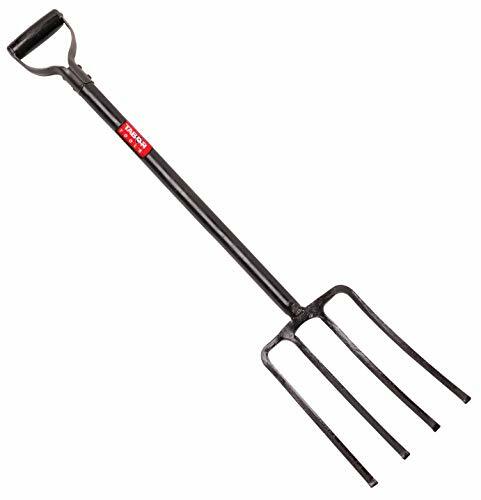 TABOR TOOLS J59A Steel Digging Fork, Heavy Duty 4-Tine Spading Fork, Garden Fork, 40” Length. by TABOR TOOLS at The Mirror Project. Hurry! Limited time offer. Offer valid only while supplies last. 4-TINE DIGGING FORK: The 4-tine digging fork for general-purpose digging and breaking tough ground. Forged from hardened and tempered high carbon steel to ensure maximum strength and toughness. This tool is suitable for heavy duty, commercial and industrial use, for example on dairy farms or on the ranch. Features an anti-corrosive black fork head. VIRTUALLY UNBREAKABLE: Loosen, lift and turn garden materials with this durable, rugged garden fork. This is a professional quality tool made for a lifetime of use! This tool will not break or bend, not even during heavy duty projects or while working in difficult soil. This is a great tool for cultivating all types of soil and for the preparation of flower beds prior to planting seeds. PREMIUM TOOL - BUILT TO LAST: The welded steel shaft provides durability that far outlasts wood-handled tools. The handle will not flex like fiberglass. The 4-tine fork head is made of anti-corrosive black steel. Dimensions: 40" (total length), 28" (handle length), 8" (head width), 12" (head height). Weight: 5.5 lb. D-GRIP HANDLE: The D-handle keeps your wrist in a neutral position to reduce strain and provides a secure grip. The non-slip D-handle provides comfort and good grip, and gives enough room to accommodate a gloved hand. Ergonomic 4 Tines Forged Pitch Fork with Hardwood Handle,Professional Manure/Bedding Fork, 47.25-inch or Over Overall in Length Pro Manure Forged Ensilage Heavy Duty Fork.Simple Assembly Required !